The shoulder area is the most mobile part of the body, but also at great risk of overuse and injury. Shoulder problems often have a slow onset and it is important to know about and recognise early symptoms. Too many people only receive symptomatic anti-inflammatory treatments. This article provides a few tips for improving reflexological treatment of shoulder problems. One of the workshops in Touchpoints ”Round about...” series is about the shoulder and how to deal with the many different problems and disorders related to this area. The shoulder is the region connecting the arm to the body and apart from the shoulder joint itself it includes the shoulder girdle consisting of the shoulder blade, collar bone and corresponding joints and muscles plus the armpit, where nerves and blood vessels pass on their way towards the arm. The anatomical construction ensures the great freedom of motion found in this body region. The shoulder joint moves the upper arm in relation to the shoulder blade and even more mobility is added through movements of the entire shoulder girdle. Try to lift you arm away from the body. The first part of the movement, until you reach a horizontal position of the arm, uses the shoulder joint. Now keep lifting the arm above horizontal as high as it will go and note, that now the rest of the shoulder girdle has taken over with the shoulder blade moving up along the thoracic wall and the collar bone swinging up in the sterno-clavicular joint. This gives an impression of the type of movements going on in the shoulder and the many muscles involved. 1) Large superficial muscles in front and back of the shoulder. These muscles add strength to the more coarse movements (ex: Trapezius, lattisimus dorsi, rhomboids, deltoid, major and minor pectorals, serratus anterior). 2) Small shoulder muscles, who form the so called rotator cuff controlling the finer movements of the shoulder joint and protecting the joint ball from luxating out of the socket (subscapularis, supra- and infraspinatus, teres minor). The only joint directly connecting the arm and the body is the sterno-clavicular joint. Apart from this the connection is purely muscular. Large forces act on the shoulder during many activities including sports. Especially sports involving the throwing of objects, using a racket and swimming. Different occupational movements may also affect the shoulder, f.ex in painters and other crafts. Common for these activities is the combination of large forces and repetitive movements involving the same anatomical structures. Every day at work or in every training session the same muscles, tendons, attachments, bursa and ligaments are strained over and over again, with a high risk of developing strain injury. The most common injuries are pulled muscles, inflammation of tendons and attachments and bursitis. Often the problems develop over a long period and it is easy to overlook early warning signs such as stiffness in the morning and during warm-up and pains during or following the activities. A good idea is to start and end each reflexology session by testing the range of motion of the shoulder - this gives the therapist a hint about the effect of the treatment and it certainly improves the client’s motivation to experience an immediate effect on mobility and/or pain reduction. The spinal column - especially segments C5 - T1. This is the origin of the brachial plexus supplying nervous innervation for the shoulder and arm (figure 1). Other important areas to include with classical reflexology technique would be the shoulder joint and shoulder girdle (of course), but also the sterno-clavicular joint and shoulder muscles. Also treat the sympathetic nervous system to stimulate blood supply for the shoulder muscles. 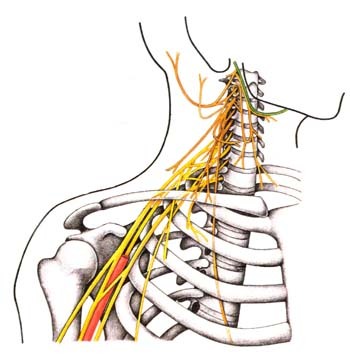 If the problem involves pinching of nerves of the brachial plexus (radiating pains in arms or fingers), besides relaxing the musculature it would be important to examine the client’s body posture and perhaps recommend certain corrections. By “sucking in” the abdominal muscles and lift the sternum and rib cage, pressure will be reduced in the so called thoracic gates, where nerves are often compromised. An important part of the treatment involves one or two exercises to do at home. With pain conditions in the shoulder the exercises should be soft, without weight and should not be done against pain. Remember to also train the front muscles. The treatment tips we describe in this article may be used in many kinds of shoulder problems. In the workshop “Round about: The Shoulder” we also look at conditions such as frozen shoulder, pain in the shoulder girdle, arthrosis, thoracic outlet syndrome, pains around the shoulder blades, etc. Most shoulder problems encountered in modern societies are not due to sports or overuse, but more often related to too little use (!) in f.ex office or computer workers. A large factor in these chronic problems is stress and it is therefore worthwhile to emphasize treatment of the autonomous nervous system (ANS) and of organs related via the ANS to the shoulder area. It is often stunning to see the effects on a frozen shoulder from working with stress reduction through the sympathetic nervous system reflexes, often much better results, than can be obtained from working the ordinary shoulder reflexes.